The Motorola Modulus® Series is a family of communications enclosures that offer a flexible approach to networking for your business applications. 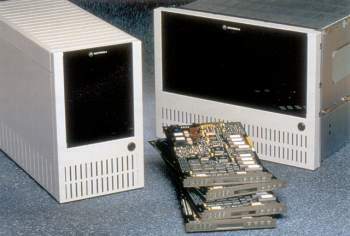 The Modulus 9 and Modulus 21 enclosures house a broad range of Motorola products providing customers with the combination of high density and configuration and migration flexibility. The Modulus 9 is a compact self-standing enclosure supporting up to 9 single-slot Motorola products. It can be placed on a desk, floor, or side by side on a 19" equipment shelf. The Modulus 21 enclosure is designed to be installed in an EIA 19" equipment cabinet. It is fully compatible with the Modulus 9, but offers the ability to house up to 21 single-slot Motorola ISG products as well as the option of power redundancy for critical applications. Product diversity within a common enclosure can be achieved with a mix and match of multiple product types. Optional Modulus 21 can be ordered in two or three PSM configurations, the cost of redundancy can be matched to the specific power requirements of individual systems. -42 VDC to -66 VDC, 17 A max. You may also want to consider pre-owned gear!